What a way to dye! This weekend was a fun getaway before starting a new job. I’m going to be working through the end of December (and hopefully longer) at a big box retailer. It appears to be a fun job. This time might be different. The store I work for is committed to giving employees regular rest periods and you face action up to including termination for NOT taking a break. I love it! It means that in a 7.5 hour shift tomorrow, there will be two 15 minute rest periods and a 1/2 hour lunch. I think it’s doable! But an experiment was needed to test this. It was necessary to see if it is possible to stand on my feet for hours at a time in a somewhat confined area. The perfect activity was… fishing! This photo was taken at the Hills Access campground just south of Iowa City. I caught this decent sized catfish on Friday afternoon. The morning and some of the afternoon was spent fishing at Lake McBride (north of Iowa City) and all that was brought in was a scrawny bluegill. In the afternoon, I stopped down to the campground and fished until close to dark. The action was slow except for this “kitty” (catfish). When he hit suddenly, the rod holder, a Y shaped stick that was pressed into the sand, abruptly snapped. The rod fell and I watched the gear start to head for the river. 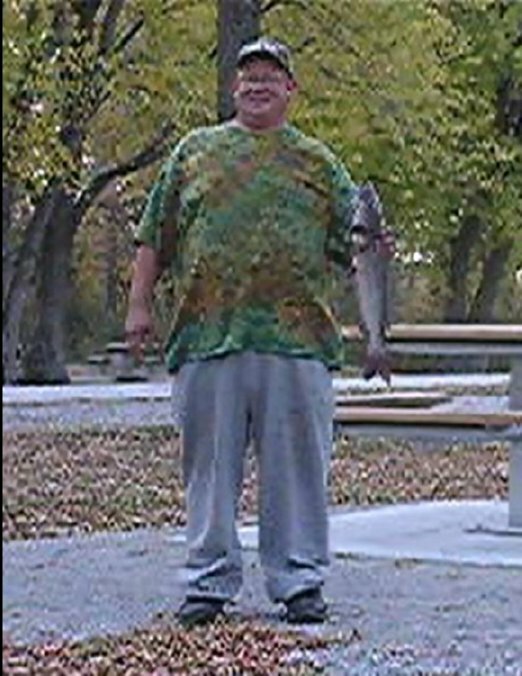 That’s one thing I love about catching “kitties” – catfish can strike very hard and fast. Talk about an adrenaline rush! Once the hook was set he fought tooth and nail, even jumping into the air. Once I saw the blue hue of his skin, I knew it was a channel catfish… YUM! The feet did remarkably well while fishing. There were no “rest periods” during the fishing exercise and I stayed pretty much in the same area, never once sitting down. It was tiring but with the new orthotics in the shoes, it was achievable. By this time on Friday, the sun was setting quickly. After dinner (a small steak and a Diet Coke), I was invited to hang out with the neighbor at the campground. He had an older, slightly rusty grey conversion van. The guy’s name is Jay, he’s about 60, and likes to hang out at this campground. I can’t fault him for that! It’s a great place. Jay is not at all bashful about how his family (whom he loves dearly) can drive him nuts and he likes to sleep in the van and read…as well as drink beer(s). Jay uses a little electric heater, similar to the way I warm my van when there is electricity. He admitted to me that even though he stays at his daughter’s, he prefers to sleep in his van with a little extension cord keeping him powered. Yup, I can identify with that! Due to the darkness I didn’t get a picture of Jay but will take one of his conversion van the next time I see him. He’s a character and a fun person to shoot the breeze with over a roaring campfire. Another vendor visited was Heart of My Home Granola . They are a small, local company that makes the best healthy granola. I bought a $5.75 bag containing 12 ounces. It’s very tasty, satisfying, and the portion lasts me about five or six servings. The heavy, resealable plastic bag works great for van trips. Check them out if you have time. The owners, a husband and wife, are the nicest people. 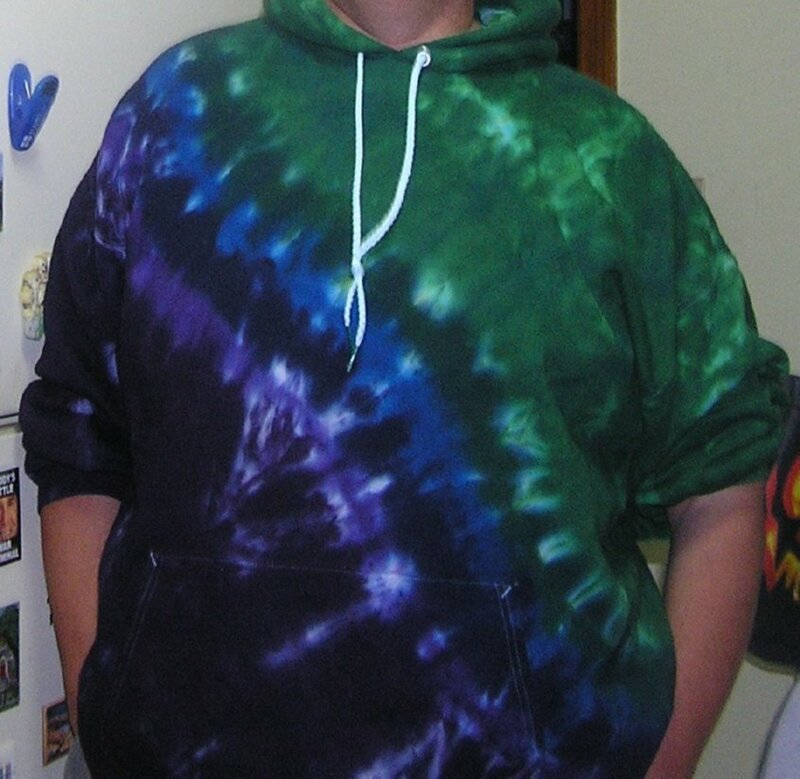 As usual, Mary, the tie dye lady, was there. She is the owner of a shop called Dyed Happy and is the person who created the shirts you see in the above two pictures. 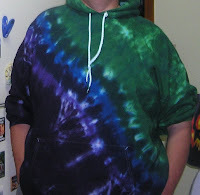 I love the camo tie dye but this time was intrigued with the sweat shirt “hoodie” pictured at the top of the blog. Mary commented on the weight loss which brought a huge grin! It was so nice to be able to buy a 3X instead of a 5X! Next year will be maybe a 2X? 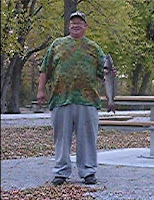 Upon returning to the campground, Saturday was another enjoyable day of fishing. The only thing caught all day was a giant carp like the one in the picture – even bigger than the catfish. I attempted to fillet it and was able to cut a couple of nice steaks out of the fish. A little posthumous surgery removed the largest of the bones. By this time it was getting dark very quickly and I was starving. Supper was a simple dish of shrimp fajitas. Walmart’s frozen RAW shrimp (I don’t like most precooked, rubbery shrimp) work great along with the peppers and onions from the farmer’s market. I also added some tomato for an even better flavor. There’s nothing like a good meal after a day of fishing! Note to self — On the next outing I’m going to make a pot of dang good chili soup. Stay tuned. Today is Sunday and I’m back at Dad’s. The two fish were fried up tonight and Dad and I ate like kings. I took a catfish fillet and rolled it up in a high fiber tortilla with a bit of mayonnaise. Yum… I’ll take that over anything Red Lobster can come up with! So how was the carp? Actually, quite tasty although kitty Jesse James preferred the catfish over the carp. Smart cat… Who can argue? Tomorrow it’s off to the new job. I’m kind of looking forward. It will be nice to have money coming in again. It’s also good for the self esteem to be doing something productive. Of course, there are still days off in the schedule and there will be more van treks throughout the winter. In the meantime, a new cargo rack for the van will arrive soon and there will be more details about it later this week. For now, take care and thanks for visiting! nice fish! nice t-shirt! you go guy..and hey extra cash is always good. hey i gave up red lobster few years back when son and i went there and they served us 7 separate baskets of the garlic rolls, and when the entree finally came it was tiny. there was a method to their madness. i have some homemade granola i made. rolled oats, little bit of honey, small bag of trail mix, heated and rolled together few mins and stored in tub. don’t know if can top the price though for what you got. keep the pics a coming!